When I was a child I used to come to the cottage on the Green on Sundays, long weekends and summer holidays. It was my Grandparents, Tommy and May White’s house and it was always full of cousins, aunts and uncles and lots of gatherings and parties were held there. Grandad had bought it in the 1950’s from “Billy the Green” Doherty who had reared a large family in the house. The summers were the best because you got to play all day on the Green and be with your friends from morning til night. The village was always busy in the summer months too with fishermen on the quay, coming and going from fishing, mending nets, checking boats. There were always visitors on holidays and people coming to Mac’s for food. When the cottage was full with cousins Nanny would make up extra beds in the sitting room and we would all pile in. In the mornings the jackdaws in the big open fireplace would waken us with their squawking and flapping wings. My favourite place to sleep though, was in the small back bedroom. We were told this was an old ships cabin from a ship that had been wrecked in the harbour many years before. This room had a low wooden ceiling with some iron rivets across it in places. There was a small skylight which was then closed in place but could have been opened in the past to allow fresh, if salty air into the cabin on a ship that crossed the Atlantic for her trade. It was a cosy room and often too hot on a warm summer evening. It was only years later that I learned that the cabin came from an American ship called the Alfred D Snow. 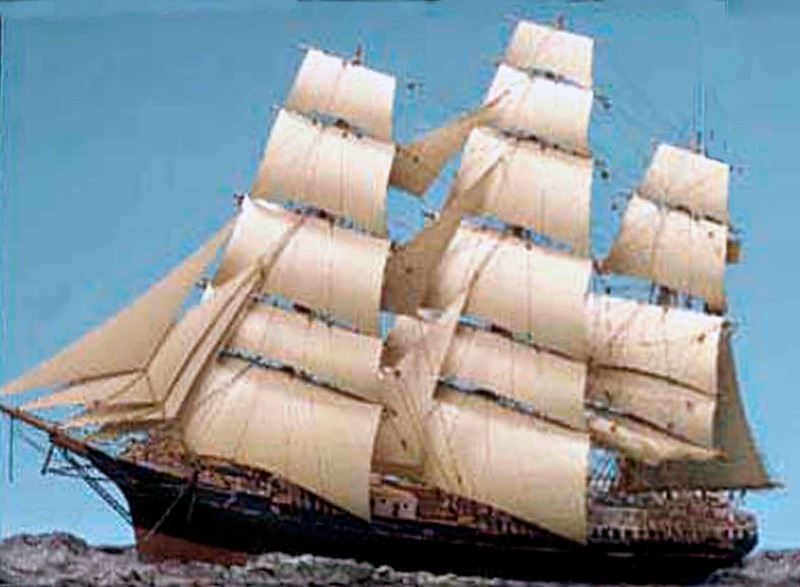 The Alfred D Snow was a three masted fully rigged all timber ship which was built in the Samuel Watts shipbuilding yard in Maine USA. She was 232 feet long with a beam of 42 feet and was built in 1877. 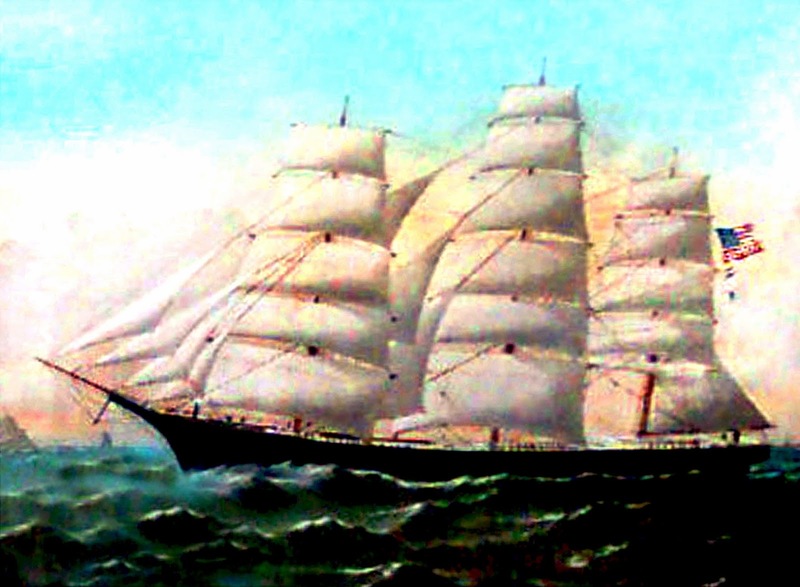 She left San Francisco on Aug 30th 1887 bound for Liverpool with a cargo of wheat under Captain William J Wiley. She had fair weather on the trip, including the rounding of Cape Horn but as she came up towards the Irish Sea a south east gale blew up and the captain found that evasive measures were required. The crew battled bravely but the storm grew in force and they were forced to call into Waterford Estuary to try find some shelter. Sails were dropped, leaving her without much helm and they tried to inch the ship in under the hook peninsula that would have given them some shelter. However the ship struck the sand close to Broomhill and got stuck fast. Heeling over, the waves crashing over, the ships boats were launched with some difficulty and one managed to make it away but it was swamped and all aboard were drowned. The others took to the rigging in the hopes of salvation. On land the people were helpless to give direct assistance. The Dunmore East lifeboat was called but didn’t respond until much later, which was a matter of controversy at the time. The tug Dauntless did try to respond. She was sheltering at Passage East but as she approached one of her paddles broke and she drifted helplessly away back up the harbour. As the gale continued to roar and the seas continued to pound, the ship started to break up and the remaining crew were washed away and they too were drowned. In total all 29 crew men died. Mostly American but also men from England, France, Germany, Norway and Russia. There was an Irish crew man named Michael O Sullivan but I haven’t found out where he came from. However in researching this piece I did learn that there was a survivor; the ships dog, a sheepdog, managed to swim to shore and climbed up the rocks to safety. During the days that followed the Captains body was recovered and was shipped home for burial in a lead lined, brandy filled casket, (I wonder did he like a drink?). Other crew men were interred in Ballyhack, but most were never found. Pieces of the wreck floated in all along the harbour. These were secured by the Coastguard apparently and were auctioned off. That’s one possibility for how it arrived in Cheekpoint. 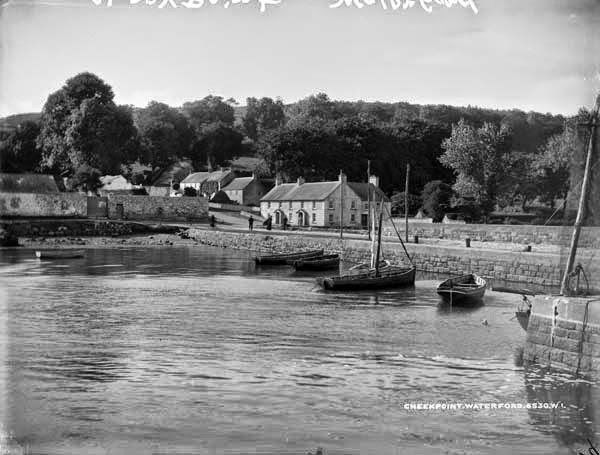 Locally, it is said that it came to Cheekpoint quay and using rollers was brought up the village and the backroad and then down behind the cottage and put in place. The Boreen wasn’t wide enough apparently. It remained as it was until a few years back when my cousin renovated the house, so that in total the shipwrights at Samuel Watts yard created a cabin that lasted over 130 years. I’m glad I had the opportunity to sleep in the cabin, but I don’t know if I would have slept so soundly had I known the whole history of the ship at that time. With thanks to Andrew Kelly for further information. The SS Pembroke was built of steel by Laird Brothers of Birkenhead, in the year 1880 and was originally a paddle steamer. The company was founded by John Laird. The Pembroke was registered at the Port of Milford. 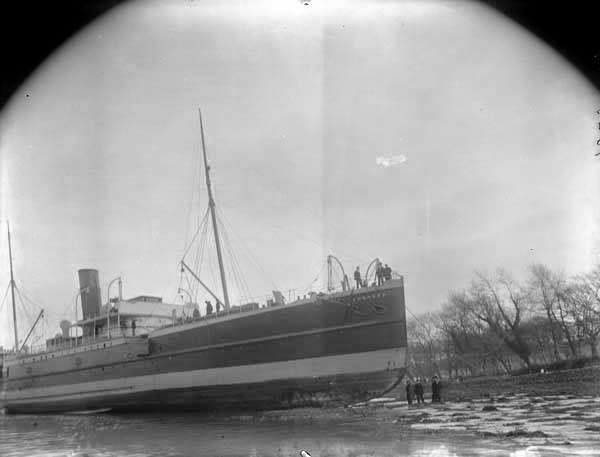 In 1896 she was altered by the shipyard into a twin screw steamship as shown above. 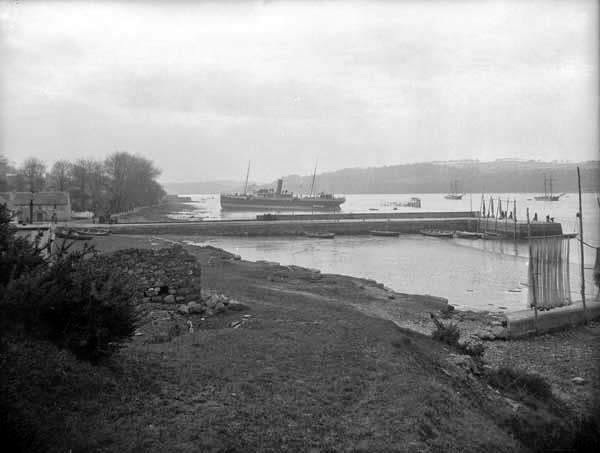 The photo seems to me to show her off Seedes bank inward bound to Waterford with Buttermilk Point in the background. 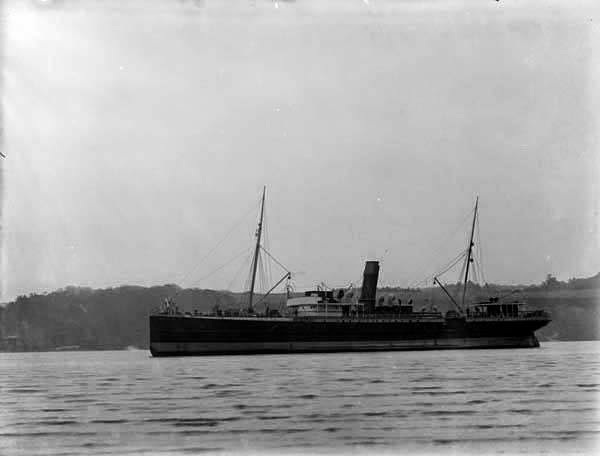 She was operated by the Great Western Railway Company and did regular sailings on the Milford Haven to Waterford route and as such would have been a regular to the people of Cheekpoint and the Waterford estuary. She departed Milford port on the 18th February 1899 with 28 passengers, the mail, and a cargo of 28 tons, under the command of Captain John Driver, and with a crew of 30. 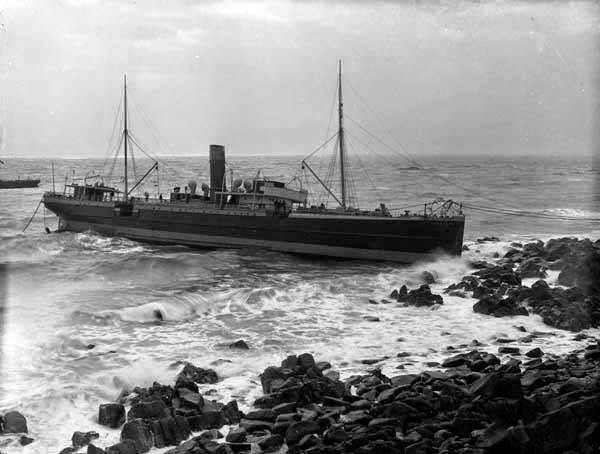 Passing close to the Saltee Islands off the Wexford coast, the master, spotted breakers a-head, and immediately reversed the engines to full speed astern. The response came to late and before the way could be taken off her, she struck the Islands. There were two men staying on the Island at the time who guided the ships boats in, and treated the passengers to tea and comfort. The second mate then set off for Kilmore Quay where he raised the alarm. The entire fishing fleet set to sea and the tug “Flying Huntsman” part of the Waterford Steamship Co fleet which was then at Dunmore responded and eventually took on the passengers, cargo and the mail and brought all to Waterford that same day. She was re-grounded at the Strand Road, above the main quay, and it seems that it was a major draw for city and country people alike. The photo above shows clearly the benefit of re grounding the vessel as a full view could be got of the damage and temporary repairs could be carried out. Once done she sailed once more for Lairds for repairs. The Pembroke returned to service the Irish Sea and continued up until 1916. In that year she was given over to general cargo runs and she was retired and sold for scrap in 1925. The subsequent inquiry into the incident on the Saltees makes for interesting reading and parts of the account have been taken directly from that source. 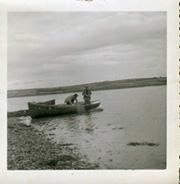 All photos above are sourced from the National Library of Ireland and were part of the AH Poole Collection. The Cheekpoint Fishing Heritage Project will host a social evening in the Reading Room Cheekpoint on Saturday 23rd Aug 2014 at 7.30 – 10pm. The event has a charge of €5 but senior citizens and children are free. Funds raised will go towards the running costs of the Reading Room. Each year since 2005 the Cheekpoint Fishing Heritage Project has contributed an event to the annual Heritage week celebration. The week focus’s attention on our country’s rich and varied heritage. The first year we participated was to stage an event as part of the Ireland Newfoundland exchange and included the now infamous Prong race which can be viewed via you tube. Subsequently we did static displays of fishing practices, presentations about the fishery including a history of artisanal fishing practices, a presentation on weirs and the origins, a number of guided walks around the village and strand and last year we delivered 10 symbols of our fishing heritage to our biggest group of attendees yet. This year is again something very different. We will host a social night in the Reading Room to which anyone with a song, poem or story about the fishery or our maritime past is welcome to contribute. It will be an informal setting but will include a cup of tea and plenty of entertainment. Waterford historian James Doherty – will tell of the remarkable WWII life of Patrick Hanlon who was sailing with the Merchant Marine and was a prisoner aboard the pride of the German fleet the Admiral Graf Spee. Eamon Duffin’s most recent work has been published with the Tramore writers group . This is the second collection with the group and Eamon has been published elsewhere. His writing includes our fishing heritage and captures the uniqueness of it beautifully. Eamon will do some self selected readings on the night. Sean Doherty will look at the Weirs in the three rivers and talk about the use’s and the heritage attached to them. 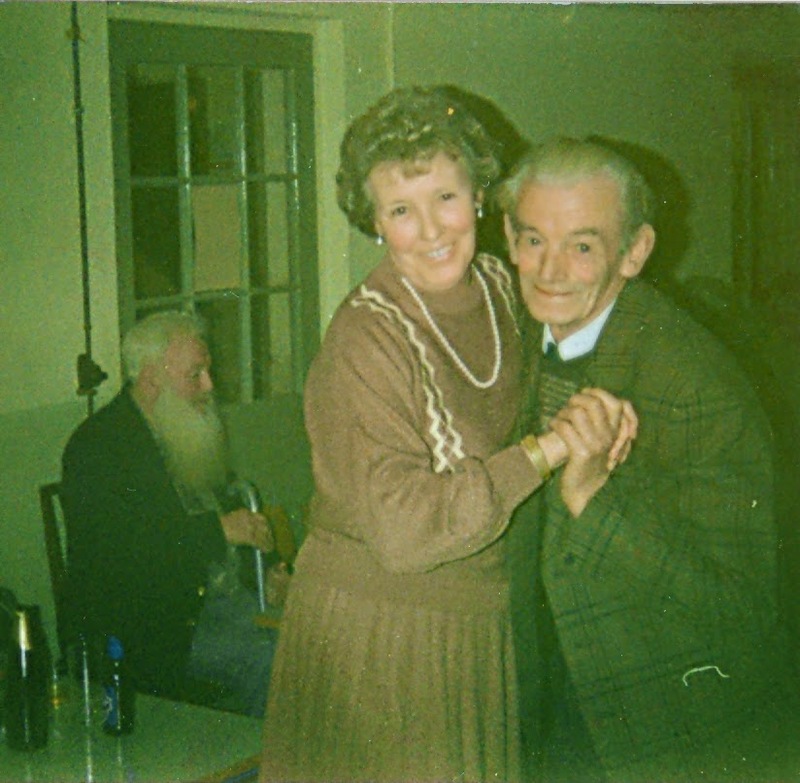 We will also do a 5 minute slide show of the senior citizen Christmas dinners of the 1980’s and possibly a piece from RTE’s nationwide about prongs and punts which was broadcast in 2006. Saturday 23rd August 2014, 7.30pm Reading Room, Cheekpoint. garden or maybe to wash the steps. walking as child to the wells to draw water. seawater following a flood or a storm. walk to Ryans Quay a further 300 yards to the nest nearest well. although the water flowed her old habits remained. hair was always softer after the rainwater. She also vowed that it was much better for watering plants. 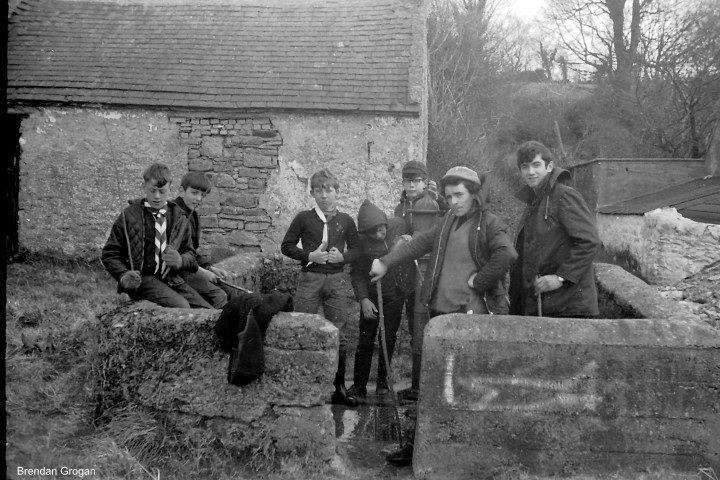 One of the wells that still is in use is the well pictured above at the Barn Quay. We often drink from it and to my mind it tastes delicious. The Teen’s told me that Jenny O’Brien recently did a science project for school in water analysis and used the water from the well which emerges out of the cliff face where once there was a Slate quarry. Apparently the water was pure and free of any pollution. that was always available. I have no doubt but there were many others. there before his family arrived in the 1940’s. present shop and my Uncle Sonny’s house. It was removed by the council in the early 1990’s. According to a recent piece I read in the Irish Independent by Damien Corless (09/08/14), wells were built across the country following the discovery by John Snow in London, that Cholera was spread by dirty water. The discovery in 1854, led to a building boom of parish pumps across the UK including Ireland – which had been ravaged by cholera at the end of the famine period. Perhaps the Cheekpoint pumps date from that period. Some recent maps I’ve seen would tend to support this view. Looking on the OSI site at their historic maps of Ireland I learned that some of the first maps produced of the area, Historic 6″ map doesn’t show the well on the green, these were drawn between 1829-41. However, it is shown on the Historic 25″ maps which were dated 1897-1913. So at least we can see for certain that it dates from 1913, and most probably earlier. areas using a similar method. Pat was a child at the time so it would have been in the mid to late 1950’s. His story got me thinking about a tap at Joanie Hanlons (where Charlie and Paul Hanlon now live) which was inside her hedge but away from the house. I always wondered why it would not have been placed on her house wall. Maybe it served the Russianside in a similar way. it could save us a lot of money. In 1937, the Irish Folklore Commission visited Faithlegg National School, then situated on the Old Road. They asked pupils in the boys class to go home and interview their relatives or elderly neighbours and to write down the stories about the village or area they came from. The boys stories, written in their own hand can be viewed online at the following link. The girls participated also, but separately from the boys, (in those days they were in different rooms) which can be viewed here. One of the boys who participated was Martin Mahon. Martin was a gentle soul who as long as I could remember lived in the Rookery, Cheekpoint. He wrote about Occupations in the village and stated that he wanted to follow his father into the fishing trade. This he did as well as going to sea. Martin liked nothing better than a pint, a smoke and telling a few yarns. Martin never married and died on October 8th 1999. He is buried at the top of Faithlegg Graveyard. The following is what he had to write about the fishing. own nets but most of them buy them now. is to oil the nets and put them out to dry. are roped they put some leads on them and then they are ready for fishing. sticking the gaff in the fish they pull him in and kill him. wait for their turn to set their nets. How much life and the Salmon fishing has changed in that time. Driftnetting for Salmon was suspended in Ireland in 2006. It has yet to re-open. Many thanks to Jim Doherty for passing on this story originally to me, and to Catherine Connolly who posted the links to both accounts on the Cheekpoint Coolbunnia/Faithlegg Facebook page.